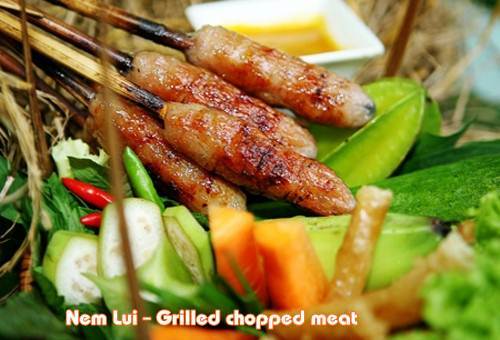 Most tourists visiting Hoi An are impressed by the local food of the old town. The water of the region and the unique flavors influence the local gastronomy. The culinary skills of local chefs of Hoi An and the inhabitants have raised eating and drinking to an art form. Besides, the traditional local dishes of Vietnam, there are also many dishes served that are a combination of Chinese and other countries influences. Because of its cultural diversity, cuisine can vary greatly from street to street and the ways in which these foods are prepared are zealously guarded family secrets. 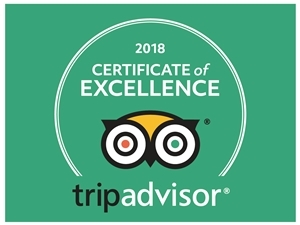 It is the diversity of Hoi An’s cuisine that makes dining such a unique and memorable experience. The simplicity of their preparation belies the range of flavors awaiting the discerning diner. The way in which to prepare a dish, from materials used to the dining experience, must obey the 5 elements of universal principle, that is: kim (metal), moc (wood), thuy (water), hoa (fire), tho (earth) and all must be balance to be considered gourmet by Hoi An standards. There are more than 60 traditional dishes that are unique to Hoi An. The following is a sampling of some of the most popular dishes. This is the popular country dish in Hoi An and Quang Nam. The noodle is yellow or white in color and made from rice flour, it is mixed with shrimp, pork, and vegetables, and topped with grilled rice paper and spices. Cao Lau is a noodle dish. The noodles are made with rice flour soaked in ash water and the cooked three times. 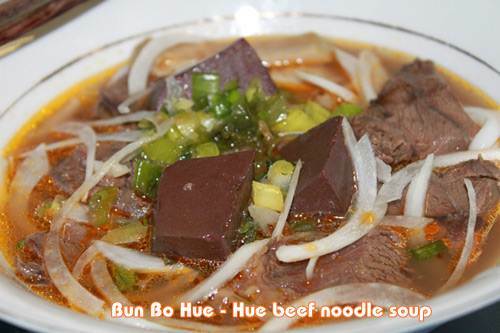 The Cao Lau noodle is usually topped with roast meat slices, vegetables, bean sprouts, and spices. 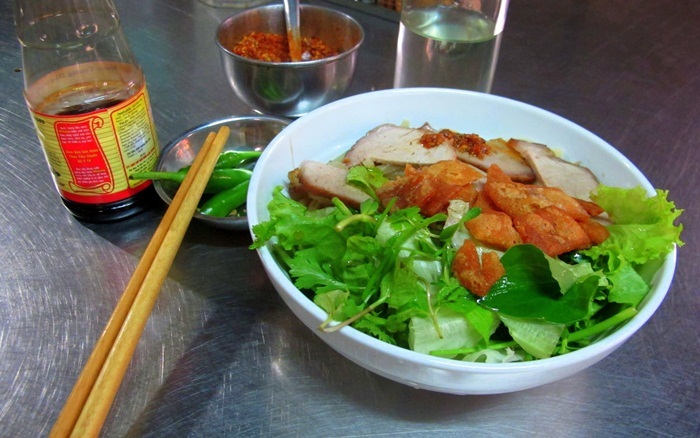 Only the water from wells in Hoi An can be used to make authentic Cao Lau noodles. This dish comes from China but has been adapted by the inhabitants to suit local tastes. Wonton is made of rice flour and filled with ingredients like shrimp, pork, egg, and spices. There are many kinds of wonton dishes: fried wonton, wonton soup or wonton and noodle soup are a few examples. Many people like these dumplings not only for their delicious flavor but also for their beautiful appearance. The French gave it the name of “white roses”. The cake is made of white rice flour and stuffed with cooked shrimp meat. The color of the flour along with the color of the shrimp meat gives it the appearance of white roses. There is only one family in Hoi An able to make this cake with good taste; they are on Hai Ba Trung Street. SuSe cake is made of sticky rice, green bean and coconut. The cake is wrapped in banana leaf and the steamed. The original name for this cake is ‘phu the” cake, which means husband and wife. The name originates from a story about a young couple that lived together in a small town. One day, the husband had to go to another city for business. Before the husband left, the wife made a special cake for him to show her love. The husband, to show his gratitude, named the cake “Phu The cake”. But the seduction of a new city and beautiful girls enticed the husband and he did not want to return home. The wife made another cake and sent it to her husband to remind him that she was patiently awaiting his return with love and affection. When the husband received the gift, he felt regret and shame, and returned home. The phu the cake became a symbol of love and faithfulness. This kind of cake is always found in traditional Vietnamese weddings. Tourists visiting Hoi An usually buy this cake as a gift to their friends. This is a cake made from the black colored and sweet tasting Gai leaf and green bean. This cake is always offered to worship ancestors during the New Year festivals or during anniversaries of departed ancestors. It’s also thought of as a kind of medicine to help revive those suffering from hangovers. This is popular and simple dish of Hoi An people. Com Hen is made with rice and mixed with clams, vegetables and spices. Che Bap (corn sweet soup) is made from tender corn and sugar. Because of the growing conditions around Hoi An, che bap can be eaten year round. Local nutritionists say this soup is very beneficial for the elderly. Ground black sesame seeds are mixed with sugar, vegetable juice, and thanh dia (a kind of Chinese medicine) and then boiled to make a pudding. A delicious food that is also atonic for people recovering from recent illness. A kind of mixed sweet soup, it’s made from green bean, dry tangerine peel and sugar. It’s very sweet and smells delicious. People say that it helps maintain good health. Green bean flour, sugar, and vegetable oil are blended and pressed into rectangular wood frames and then toasted. Banh dau xanh can be used with many kinds of meat or vegetable fillings. Visitors like to buy this cake as gifts for friends and it keeps for a long time.